Combustion is the chemical term for a process known more commonly as burning. It is one of the earliest chemical changes noted by humans, due at least in part to the dramatic effects it has on materials. Early humans were probably amazed and frightened by the devastation resulting from huge forest fires or by the horror of seeing their homes catch fire and burn. But fire (combustion)—when controlled and used correctly—was equally important to their survival, providing a way to keep warm and to cook their meals. Today, the mechanism by which combustion takes place is well understood and is more correctly defined as a form of oxidation. This oxidation occurs so rapidly that noticeable heat and light are produced. In general, the term "oxidation" refers to any chemical reaction in which a substance reacts with oxygen. For example, when iron is exposed to air, it combines with oxygen in the air. That form of oxidation is known as rust. Combustion differs from rust in that the oxidation occurs much more rapidly, giving off heat in the process. Probably the earliest scientific attempt to explain combustion was made by Johann Baptista van Helmont, a Flemish physician and alchemist who lived from 1580 to 1644. Van Helmont observed the relationship between a burning material and the resulting smoke and flame it produced. He concluded that combustion involved the escape of a "wild spirit" ( spiritus silvestre ) from the burning material. This explanation was later incorporated into the phlogiston theory (pronounced flow-JIS-ten), a way of viewing combustion that dominated the thinking of scholars for the better part of two centuries. According to the phlogiston theory, combustible materials contain a substance—phlogiston—that is given off by the material as it burns. A noncombustible material, such as ashes, will not burn, according to this theory, because all phlogiston contained in the original material (such as wood) had been driven out. The phlogiston theory was developed primarily by German alchemist Johann Becher (1635–1682) and his student Georg Ernst Stahl (1660–1734) at the end of the seventeenth century. Chemical bond: Any force of attraction between two atoms. Fossil fuel: A fuel that originates from the decay of plant or animal life; coal, oil, and natural gas are the fossil fuels. Internal-combustion engine: An engine in which the chemical reaction that supplies energy to the engine takes place within the walls of the engine (usually a cylinder) itself. Oxide: An inorganic compound (one that does not contain carbon) whose only negative part is the element oxygen. Thermochemistry: The science that deals with the quantity and nature of heat changes that take place during chemical reactions and/or changes of state (for instance, from solid to liquid or gas). Although scoffed at today, the phlogiston theory explained what was known about combustion at the time of Becher and Stahl. One serious problem with the theory, however, involved weight changes. Many objects actually weigh more after being burned than before. How this could happen when phlogiston escaped from the burning material? One explanation that was offered was that phlogiston had negative weight. Many early chemists thought that such an idea was absurd, but others were willing to consider the possibility. In any case, precise measurements had not yet become an important feature of chemical studies, so loss of weight was not a huge barrier to the acceptance of the phlogiston concept. that helped unravel the mystery of the combustion process was the discovery of oxygen by Swedish chemist Karl Wilhelm Scheele (1742–1786) in 1771 and by English chemist Joseph Priestley (1733–1804) in 1774. Lavoisier used this discovery to frame a new definition of combustion. Combustion, he theorized, is the process by which some material combines with oxygen. For example, when coal burns, carbon in the coal combines with oxygen to form carbon dioxide. Proposing a new theory of combustion was not easy. But Lavoisier conducted a number of experiments involving very careful weight measurements. His results were so convincing that the new oxidation theory was widely accepted in a relatively short period of time. Lavoisier began another important line of research related to combustion. This research involved measuring the amount of heat generated during oxidation. His earliest experiments involved the study of heat lost by a guinea pig during respiration (breathing), which Lavoisier called a combustion. He was assisted in his work by another famous French scientist, Pierre Simon Laplace (1749–1827). As a result of their research, Lavoisier and Laplace laid down one of the fundamental principles of thermochemistry, the study of heat changes that take place during chemical reactions. The duo found that the amount of heat needed to decompose (break down) a compound is the same as the amount of heat liberated (freed, or given up) during the compound's formation from its elements. This line of research was further developed by Swiss-Russian chemist Henri Hess (1802–1850) in the 1830s. Hess's development and extension of the work of Lavoisier and Laplace has earned him the title of father of thermochemistry. From a chemical standpoint, combustion is a process in which some chemical bonds are broken and new chemical bonds are formed. The net result of these changes is a release of energy, known as the heat of combustion. For example, suppose that a gram of coal is burned in pure oxygen with the formation of carbon dioxide as the only product. The first step in this reaction requires the breaking of chemical bonds between carbon atoms and between oxygen atoms. In order for this step to occur, energy must be added to the coal/oxygen mixture. For example, a lighted match must be touched to the coal. Humans have been making practical use of combustion for thousands of years. Cooking food and heating homes have long been two major applications of the combustion reaction. With the development of the steam engine by Denis Papin, Thomas Savery, Thomas Newcomen, and others at the beginning of the eighteenth century, however, a new use for combustion was found: performing work. Those first engines employed the combustion of some material, usually coal, to produce heat that was used to boil water. The steam that was produced was then able to move pistons (sliding valves) and drive machinery. That concept is essentially the same one used today to operate fossil-fueled electrical power plants. Before long, inventors found ways to use steam engines in transportation, especially in railroad engines and steam ships. However, it was not until the discovery of a new type of fuel—gasoline and its chemical relatives—and a new type of engine—the internal-combustion engine—that modern methods of transportation became common. Today, most forms of transportation depend on the combustion of a hydrocarbon fuel (a compound of hydrogen and carbon) such as gasoline, kerosene, or diesel oil to produce the energy that drives pistons and moves vehicles. The use of combustion as a power source has had such a dramatic influence on human society that the period after 1750 has sometimes been called the Fossil Fuel Age. Still, the widespread use of combustion for human applications has always caused significant environmental problems. Pictures of the English countryside during the Industrial Revolution (a major change in the economy that resulted from the introduction of power-driven machinery in the mid-eighteenth century), for example, usually show huge clouds of smoke given off by the burning of wood and coal in steam engines. At the dawn of the twenty-first century, modern societies continued to face environmental problems created by the enormous combustion of carbon-based fuels. For example, one product of any combustion reaction in the real world is carbon monoxide. Carbon monoxide is a toxic (poisonous; potentially deadly) gas that sometimes reaches dangerous concentrations in urban areas around the world. 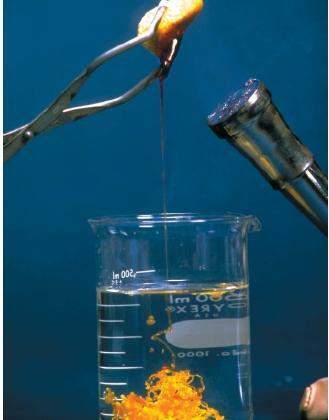 Oxides of sulfur (produced by the combustion of impurities in fuels) and oxides of nitrogen (produced at high temperatures) can also have harmful effects. The most common problem associated with these oxides is the formation of acid rain and smog. Even carbon dioxide itself, the primary product of combustion, can be a problem: it is thought to be at the root of recent global climate changes because of the enormous concentrations it has reached in the atmosphere. The article is informative . Addtion to this I like to know abut the calorific values of CO, and parameter which affects the same. this is very very very good because it explains everything you need to know in an understandible way. it is also great for revision as i have got an exam coming up. I really think this is a great thing to read before exams and you should write more of them! This is great for using in a combustion project. It is really hard to find all the information to cite it properly. This is a really great article. Succinct, informative and written in an enjoyable, understandable way. Thanks! Very Infomative, easy to cite and i really like the format. It gives me a lot of information about combustion. I REALLY LIKE IT VERY MUCH. Does anyone know an example of combustion in the environment that occurs today? Please Help i have an assignment due in 2 days. This was very helpful for a college project that i was doing and i made the highest score out of my whole class because of this article.